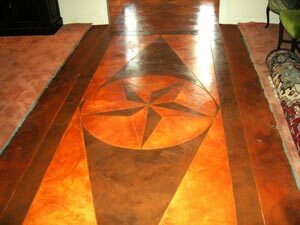 Concrete staining is one of the most dynamic concrete treatment options for commercial and residential concrete surfaces. The coloring process can vary depending on the coloring process that can provide variations that can mimic even the most expensive of natural stone surfaces. Stains and dyes can be used to color large areas, to achieve numerous effects, and in high detail applications such as stenciling. Whatever your desired design or final finish, there is likely a stain or dye for it. Colored Concrete: The wide variety of colors and color combinations will turn your traditional grey concrete into a unique and colorful work of art. Unlike Acid Stain, dyes are not a chemical reaction with the concrete floor but rather a chemical dying of the concrete floor. Due to the fact that concrete dyes are not a chemical reaction, Concrete stain coatings recommends using concrete floor dyes over a polished concrete surface, overlay floor or as an accent color to an acid stain concrete floor. In addition, concrete dyes should not be used on exterior concrete floors as the UV can bleach the color from the colored concrete surface. Acid Staining: Acid staining concrete is a process that chemically reacts with the surface of the concrete. The concrete accepts the stain in varying degrees of intensity, creating stunning multi-hued color variations for a perfectly aged look or distinctive effects. Acid stained concrete has a mottled, variegated, marble like look. It creates beautiful colors on concrete, mostly earth tone browns, reddish browns and greens. You can also create your own shades by mixing and matching your available colors, or by applying them at different rates. Never expect acid staining to be uniform or have an even tone; you’ll get different reactions from slab to slab, and even on the same job you may see different coloration patterns. Concrete acid stain can be applied to walks, entrances, driveways, living rooms, bathrooms, patios, high traffic areas and even vertically to any cementitious surface. On some applications where the surface is textured, as in stamped concrete or stamped overlays, concrete acid stain provides even more depth of color, larger selection and realistic look to the surface. Price – There are many factors that contribute to the price of concrete staining. Price will be determined on the condition of the existing concrete (new, old, stained, damaged, holes from prior carpet tack strips, etc) and what you have in mind as the final product/look. In order to provide an accurate price, we need to see the concrete and provide you with a variety of options so we may assist you in narrowing down what you like the most in look, color and texture. Installation – The installation process depends on the the same factors as stated above. 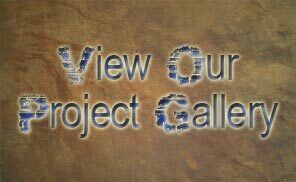 There will be a processing of prepping/grinding/sanding the concrete, then applying some type of base coat or new canvas, then applying texture and/or design if requested, then applying color or multiple colors and finally sealing the overall layers which may require multiple coats. If you already have an existing decorative concrete floor and are looking for a repair, recolor or sealing only, then the process will not be as detailed as noted above. What color can I get and can I get it like the photo I saw on your web site? Color/Final Look – Decorative concrete is a custom flooring option and everything related to color, texture and the final look is tailored to your liking. Photos are there to assist you in the decision making process. Colors and textures are unlimited. While we always strive to make your floor look like what you may have shown us in a photo or example, concrete is a dynamic substrate and varies from slab to slab. 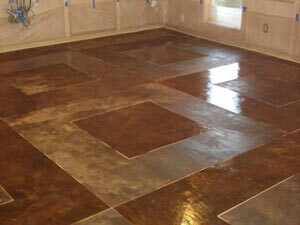 Stained concrete can be customized to fit any need in your home or business. Whether you are pouring a new floor surface, or if your floor already exists, we can beautify your home or business with an elegant, easily maintained, and energy saving stained concrete floor design that is customized to your desires. 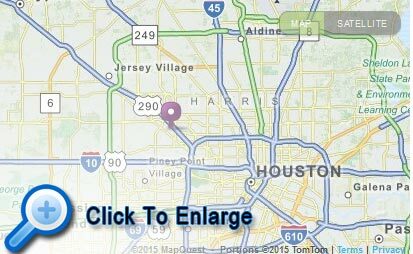 Fill out the information below, and one of our stained concrete design experts will be in contact with you, or call us at 713-682-8337 for assistance.